"Roger wheels stop, Endeavour - welcome home. Congratulations to you and the crew on an outstanding mission - installing the Tranquility Node, and opening the Cupola's windows to the world." "Houston, it's great to be home, it was a great adventure." The astronauts onboard space shuttle Endeavour concluded their two-week flight to the International Space Station. The orbiter landed at Kennedy Space Center, Fla. Sunday evening. Live HD coverage at SpaceVidCast. Live video at SFN and Florida Today. Discussion at Nasaspaceflight. Landing blog at NASA. Pics and video at KSC. More clips at Space Multimedia. Check the links at right for play-by-play and NASA TV. All plans are go for the second spacewalk of shuttle mission STS-130 at 9:09 p.m. EST, resuming the integration of the International Space Station’s new Tranquility module. 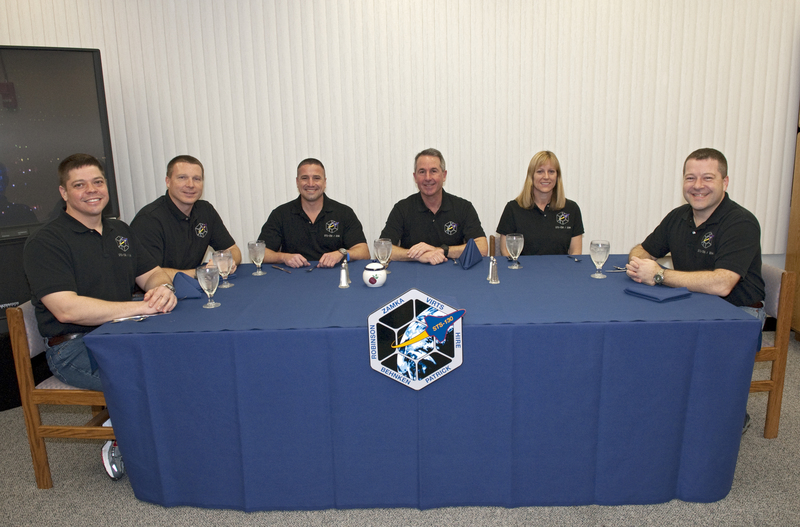 The crew members from the station and shuttle Endeavour also have learned they’ll have an extra day on orbit together. Spacewalkers Robert Behnken and Nicholas Patrick will spend the first part of the spacewalk connecting two ammonia loops, with two lines in each loop, from the Destiny module to Tranquility, hooking the new module to the station’s cooling system, and open one of those loops to initiate cooling of the module. Then they’ll install thermal covers on Tranquility’s keel pin and trunnions, to prevent condensation inside the module, outfit the nadir docking port of Tranquility for the relocation of the cupola module, and install handrails. 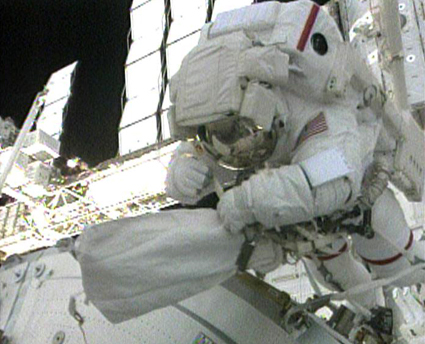 The spacewalk is scheduled to conclude at 3:39 a.m. Sunday. Early Saturday morning the crew members outfitting Tranquility were unable to install a center disk cover on the module’s outboard docking port due to interference with the cover’s attach mechanism from hardware inside the cupola; that cover protects the docking interface from debris and temperature extremes when there’s no module attached to it. 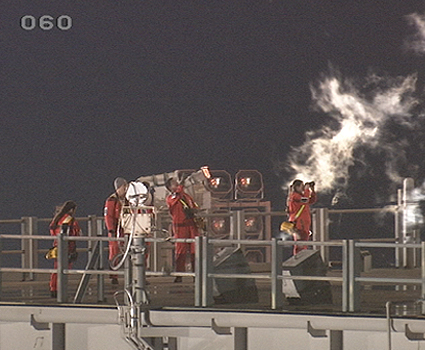 The planned depressurization and grappling of the cupola at the end of the crew work day has been deferred to permit troubleshooting of that situation. Mission managers today approved adding an extra day to the flight. That day, which will be a new Flight Day 11 beginning Wednesday afternoon, will be used to relocate two Water Recovery System racks, the Waste Hygiene Compartment and the Oxygen Generation System into Tranquility. Those relocations were on hold pending the repairs conducted earlier in the flight, and enough run time on the system to generate needed samples for return to Earth for analysis. Endeavour’s landing now will occur Sunday night, Feb. 21. Live HD coverage at SpaceVidCast. Live video at SFN and Florida Today. Discussion at Nasaspaceflight. Check the links at right for play-by-play and NASA TV. 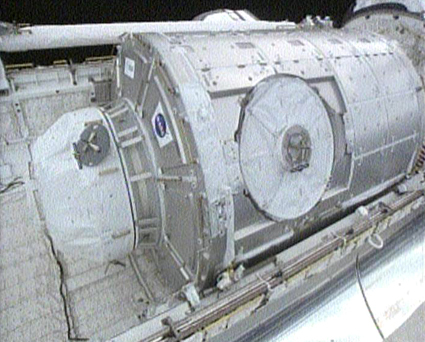 STS-130 crew members installed a 2,600-cubic-foot addition to the International Space Station early Friday, combining the talents of robotic arm operators and spacewalkers to connect the Italian-built Tranquility module. Tranquility was installed at 1:20 a.m. EST Friday over the Indian Ocean west of Singapore. 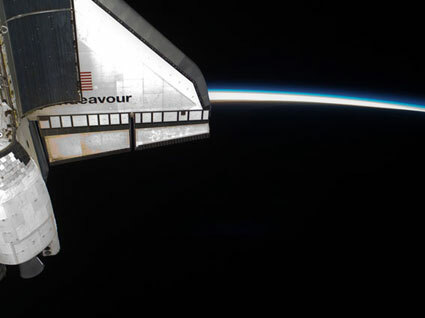 Mission Specialist Kay Hire and Pilot Terry Virts used the station’s Canadarm2 to pull Tranquility out of the space shuttle Endeavour’s payload bay and position it on the port side of the station’s 10-year-old Unity module. Tranquility was locked in place with 16 remotely controlled bolts. Spacewalkers Bob Behnken and Nick Patrick stepped outside the Quest airlock module at 9:17 p.m. Thursday and immediately began preparing the new module for its trip from the cargo bay to the station. Mission Specialist Steve Robinson helped coordinate the 6-hour, 32-minute spacewalk, which ended at 3:49 a.m. Friday. As Behnken and Patrick waited for the robotic arm operators to carefully maneuver Tranquility into position, they relocated a temporary platform from the Special Purpose Dexterous Manipulator, or Dextre, to the station’s truss structure and installed two handles on the robot. 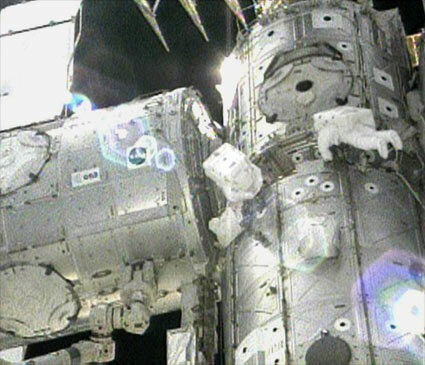 Once Tranquility was structurally mated to Unity, the spacewalkers connected heater and data cables that will integrate the new module with the rest of the station’s systems. They also pre-positioned insulation blankets and ammonia hoses that will be used to connect Tranquility to the station’s cooling radiators during the mission’s second spacewalk that begins Saturday night. The station’s new room with a view, the cupola, will be moved from Tranquility’s end to its Earth-facing port on Sunday. As the spacewalk ended, Mission Control reported that all data and heater connections were working well, and that the vestibule separating Tranquility and Unity had passed its initial leak check. Live video at SFN and Florida Today. Discussion at Nasaspaceflight. Status Report #9 here. Flight Day 4 pics and video are up at the JSC Gallery. More clips at Space Multimedia. CFNews13 has a new "inside view" launch clip. Check the links at right for play-by-play and NASA TV. Space shuttle Endeavour docked with the International Space Station at 12:06 a.m. EST Wednesday, delivering the Tranquility module and its new room with a view, the cupola. Endeavour Commander George Zamka guided the orbiter to a docking with Pressurized Mating Adapter-2 as the two spacecraft were flying 215 miles above Earth off the western coast of Portugal. 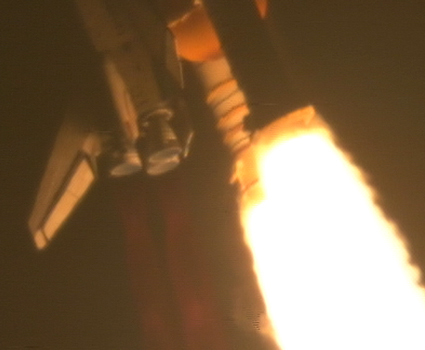 When the shuttle arrived within 600 feet of the station, Endeavour performed the nine-minute Rendezvous Pitch Maneuver, or “back flip.” Zamka rotated the orbiter backwards, enabling space station Commander Jeffrey Williams and Flight Engineer Oleg Kotov to take high-resolution pictures of the shuttle. 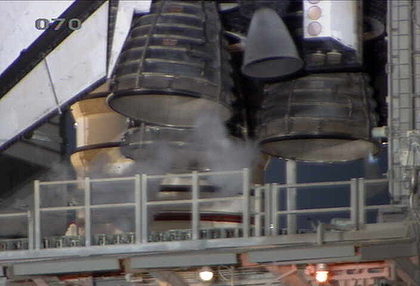 The images will be analyzed by experts on the ground to assess the health of Endeavour’s heat shield. The shuttle and station crews opened hatches at 2:16 a.m. as Endeavour and the outpost flew off the northwest coast of Australia. With the arrival of Endeavour’s six astronauts, the station’s population grows to 11 and its mass tops 1 million pounds. Endeavour’s crew will awaken at 4:14 p.m. Wednesday’s work will focus on supply transfers, spacewalk preparations and Water Recovery System repairs. Thursday’s work will focus on installation of the new Tranquility module onto the Unity module and the mission’s first spacewalk. Live video at SFN and Florida Today. Discussion at Nasaspaceflight. Status Report #5 here. Flight Day 2 and Mission Control pics, as well as video from FD1 and FD2 are up at the JSC Gallery. Launch pics and video at KSC. More clips at Space Multimedia. Check the links at right for play-by-play and NASA TV. The astronauts aboard space shuttle Endeavour are into their first full day in space and on the way to install the final components of the U.S. segment of the International Space Station. Pilot Terry Virts will assist Commander George Zamka with a firing of the shuttle’s jets to refine its approach to the International Space Station for the planned Tuesday night docking. Mission Specialists Kay Hire and Nick Patrick will be at the controls of the shuttle robotic arm tonight to unberth the Orbiter Boom Sensor System from the starboard sill to begin the standard post-launch inspection of the thermal protection system tiles and reinforced carbon carbon panels on Endeavour’s nose cap and wing leading edges. The inspection, commanded in shifts by Zamka, Virts, Hire, Patrick and Mission Specialist Steve Robinson, uses cameras and lasers at the end of the OBSS to provide 3-D views of the orbiter. That data will be reviewed by experts on the ground looking for any evidence of damage sustained during launch. Later in their day spacewalkers Patrick and Bob Behnken conduct a checkout of the spacesuits they will wear during three spacewalks to complete installation of the Tranquility node and cupola module to the station. Then they’ll install the centerline camera in Endeavour’s Orbiter Docking System while Hire and Robinson complete a check out of the rendezvous tools the crew members will use during Tuesday night’s approach to the station. Live HD coverage at SpaceVidCast. Live video at SFN and Florida Today. Discussion at Nasaspaceflight. Status Report #3 here. Flight Day 1 pics are up at the JSC Gallery. Red Huber's pics at Sentinel. Pics and video at KSC. Launch videos at Write Stuff. More clips at Space Multimedia. Check the links at right for play-by-play and NASA TV. "..and LIFTOFF of Shuttle Endeavour: NASA's final Space Station crew compartment that brings a bay-window view to our celestial back yard!" 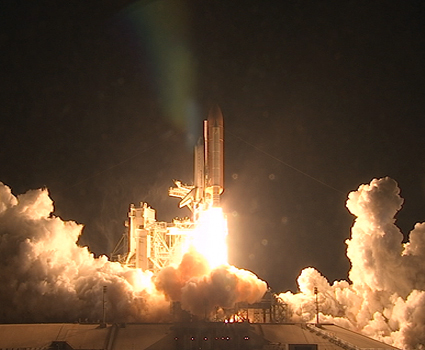 Space Shuttle Endeavour Lifts Off! 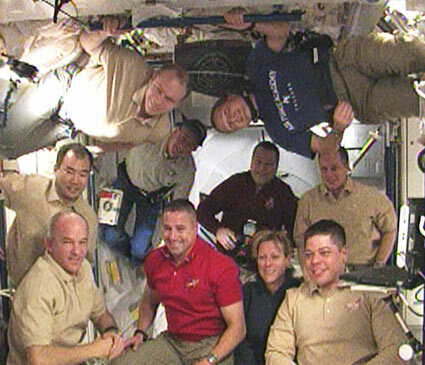 Commander George Zamka will lead the STS-130 mission to the International Space Station aboard space shuttle Endeavour. Terry Virts will serve as the pilot. 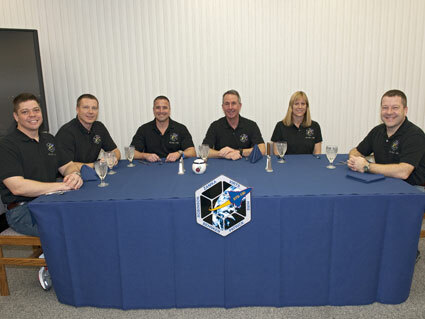 Mission Specialists are Nicholas Patrick, Robert Behnken, Stephen Robinson and Kathryn Hire. Virts will be making his first trip to space. Shuttle Endeavour and its crew will deliver to the space station a third connecting module, the Italian-built Tranquility node and the seven-windowed cupola, which will be used as a control room for robotics. The mission will feature three spacewalks. Launch video at YouTube. Tracking at N2YO. Live HD coverage at SpaceVidCast. Live video at SFN and Florida Today. Discussion at Nasaspaceflight. Launch blog at NASA. Pics and video at KSC. More clips at Space Multimedia. Check the links at right for play-by-play and NASA TV. Live HD coverage at SpaceVidCast. Live video at SFN and Florida Today. Discussion at Nasaspaceflight. Preflight pics are up at JSC and Sentinel. Launch blog at NASA. Pics and video at KSC. More clips at Space Multimedia. Check the links at right for play-by-play and NASA TV. Managers officially have scheduled space shuttle Endeavour's next launch attempt for Monday, Feb. 8 at 4:14 a.m. EST. The Mission Management Team will meet at 6:15 p.m. Sunday to give the "go" to fill Endeavour's external fuel tank with propellants. 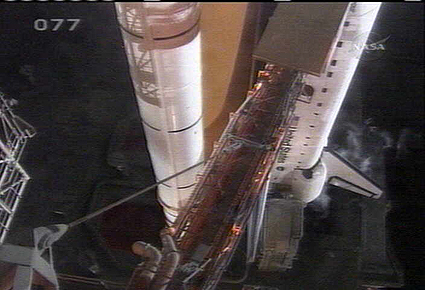 Tank loading would begin at 6:45 p.m.
Looks like Superbowl Sunday will be spent prepping for tomorrow morning's launch. Did you know that today's coin toss will use a flip coin that was flown on STS-129? That mission counted former NFLer Lee Melvin among its crew.